If The Still could turn its Airstream trailer kitchen into a time machine, we’d go back in time to shake the hand of the person who dreamed up Taco Tuesday. This truly brilliant concept has brought so much joy to the masses, it staggers the mind. Even without a time machine, you can enjoy pure taco bliss every single Tuesday at The Still, as we offer unlimited street tacos and tequila for just $29 per person from 4pm on. Here, we’ll tell you a little bit more about the special and five reasons why it simply cannot be missed! Tuesday is just one day after Monday, which means the weekend is still a long way off. Taco Tuesday to the rescue! The Still’s Tacos and Tequila special, which kicks off at 4pm every Tuesday and lasts til closing, is the perfect antidote to the early workweek blues. It’s the ideal time to connect with with friends over delicious food and drink. Tacos and tequila are always festive, and they’re bound to put you back in an attitude of gratitude for the good things in life, no matter how many days you still have to wait til FriYAY. You need this…and you deserve it! 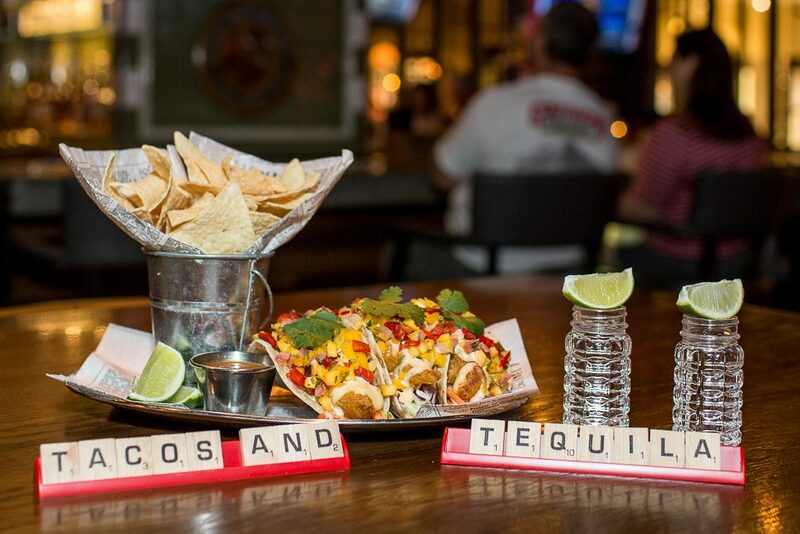 Our Tacos and Tequila Tuesdays are one of the best deals in town. We don’t want you to faint from sheer pleasure or anything, but for just $29, you get all the tacos and tequila you can handle! Which leads to the question: how much can you handle? Get your fill for a great price at The Still every Tuesday! At The Still, we’re known for our creative tacos. 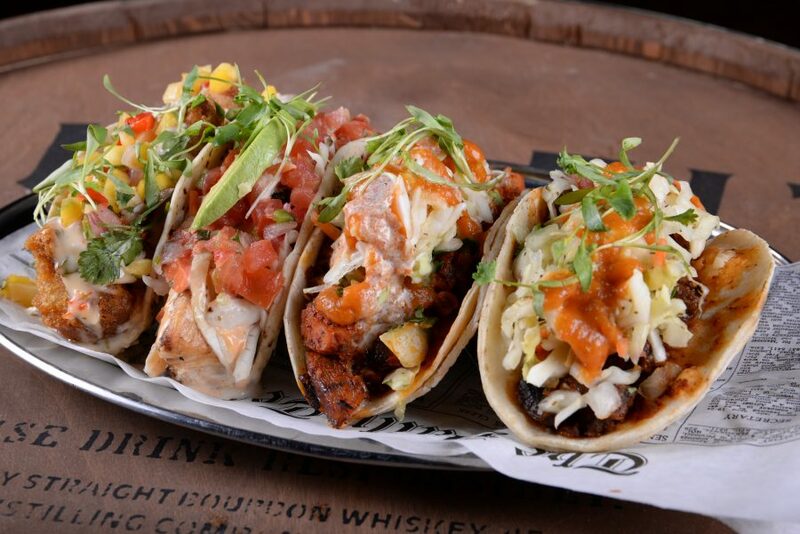 During our Tacos & Tequila Tuesdays, you can feast on two delectable types of street tacos as part of the special. First up is a perennial crowd favorite, our Chicken Street Tacos. These tacos are a little sweet, plenty savory, and completely crave-worthy. They’re made with slow-cooked and flavor-packed al pastor chicken, and served with pineapple slaw and arbol salsa. The second option is another beloved classic, our Steak Street Tacos. Spice meats–er, meets–flavor with these hearty tacos, which start with marinated carne asada and are finished with Mexican slaw and arbol salsa. Of course, as with all of our tacos, both options are served with warm chips and arbol salsa. If you feel like expanding your options or don’t care for tequila, don’t worry. You can still enjoy our full bar menu on Tuesdays for regular prices. It’s your night! Our full menu is still available. If you want to heighten your taco experience by adding a salad like our Organic Mixed Greens Salad, made with fresh cut vegetables and white balsamic vinaigrette and with the option to add chicken, you can do that. Or, if you need a little something sweet to balance out all that savory taco deliciousness, you might want to opt for our Deep Fried Oreos, a masterpiece of a dessert if there ever was one. They’re made with red velvet batter, birthday cake Oreos, and cream cheese icing. All of our mixed drinks, as well as beer and wine are also available if you’re craving something other than tequila! ** We like you to have options. Conclusion: Tuesday doesn’t have to be a dull spot in your week. Even though the weekend may be a long way off, the party spirit is alive and well every Tuesday at The Still, the ultimate Las Vegas sports bar. Be sure to join us for Taco & Tequila Tuesdaysto get your fill of delicious street tacos and life-enhancing tequila every week for just $29 per person! 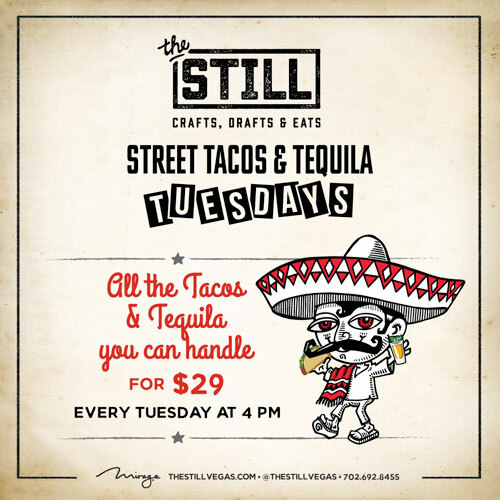 Have you experienced Taco Tuesday at The Still yet?